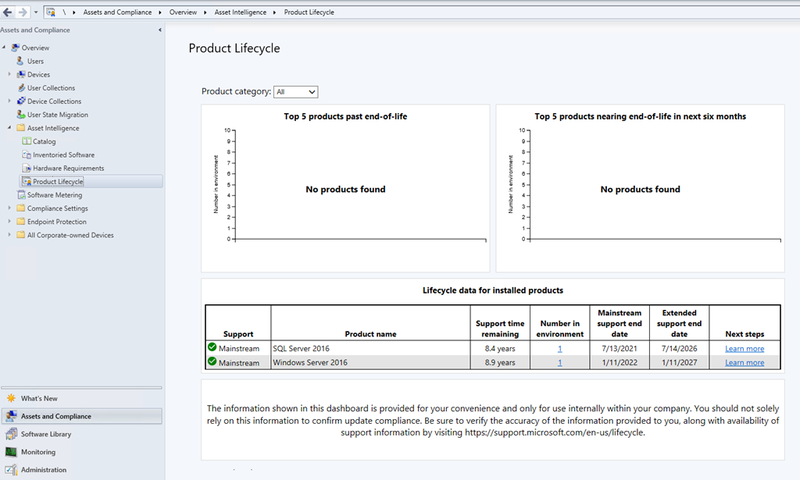 Another of the small but useful additions to Configuration Manager in tech preview 1802 is the product life cycle dashboard. 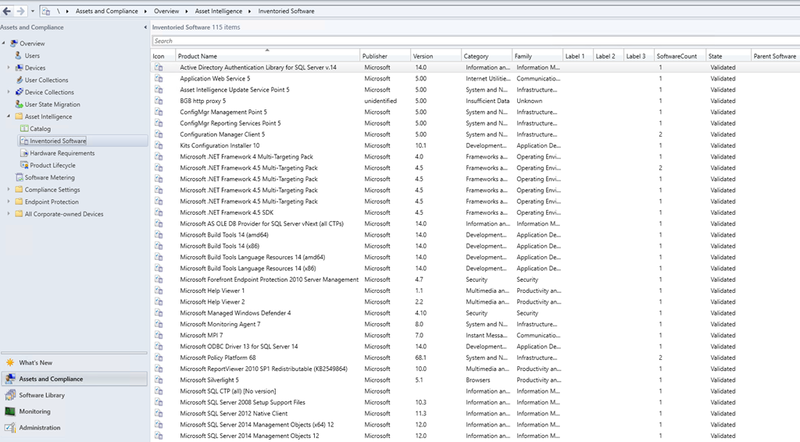 This dashboard sits under Asset Intelligence which is in the Assets and Compliance workspace in the SCCM console. The products listed in Asset Intelligence are based on the hardware inventory which inventories the relevant reporting classes you enable in client settings. If that doesn’t mean anything to you go and check out the Microsoft documentation on this here. Search for the Installed_Software – Asset Intelligence class and tick the box for this. Next time your hardware inventory runs on your clients then it should start to bring in the Inventoried software. Once you have entries in here, the new product lifecycle dashboard will give you an indication of products that are past their end-of-life, products that are nearing end-of-life (within 6 months) and also general information about the products that have been inventoried. The next logical question here is “Can I export this data?” Of course you can, there are 4 reports added into the Asset Intelligence folder of the default reports which detail all the data. From here you can export the information in a variety of formats and why not even set up a subscription to email the boss say once a month. Enjoy this extended visibility of your products! However, the “Product Lifecycle node” isn’t showing on my console, I have the latest version of SCCM (v1802). Hi, This post was based on “Tech Preview” 1802, which isn’t the same as the Current Branch release of 1802. I would expect to see the dashboard become fully available perhaps in the 1806 release of Configuration Manager Current Branch. It’s just version naming semantics, easily confused.